We know that a healthier community is good for business. That’s why VASEY has made a strong commitment to support organizations that improve the quality of life for our neighbors. We encourage our team members to participate in special projects, and they respond with enthusiasm. Here are photos, videos, and details of some of our recent efforts. 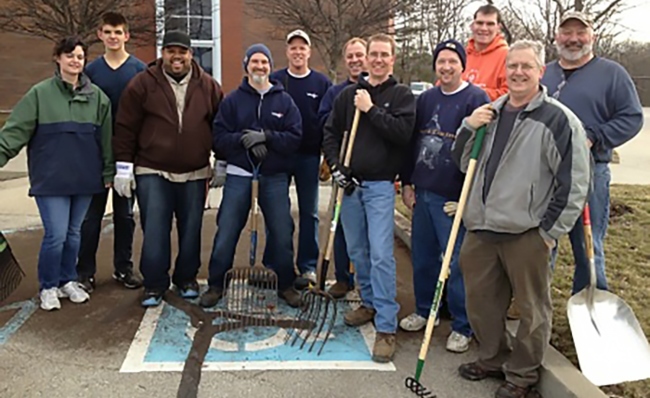 A few members of the VASEY team lent a helping hand to a nearby neighbor, the Zionsville Presbyterian Church. Several team members helped prepare the grounds of the church for the services to be held during Easter week. Additionally, they did a collection for the church’s food pantry and dropped it off on mulch day. Giving back to the community is important at VASEY. We enjoy helping others as well as having fun working together – inside and outside of the company! At the end of June 2017 we installed 20 air conditioning units at Outside the Box in Indianapolis, IN. Founded in 2008, Outside the Box (OTB) supports more than 250 individuals with intellectual and developmental disabilities. OTB’s goal for both employees and participants is the opportunity for individualized growth. Whether in the curriculum based Day Program, the creative arts experience of Studio OTB, or the customized Employment Services, they want all people to be the best they can be. Our team of VASEY volunteers spent their Saturday morning bringing much needed comfort to everyone at the OTB facility.